Panasonic Toyota Racing finished the 2009 season on a positive note with a double points finish in the Abu Dhabi Grand Prix at Yas Marina Circuit this evening. 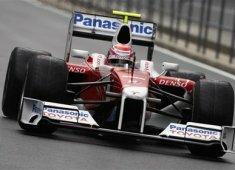 Kamui Kobayashi gave a brilliant performance to score points in just his second Formula 1 race while Jarno Trulli finished in the top eight for the eighth time this season. Both drivers started on the medium compound Bridgestone Potenza tyres with Jarno battling hard on the opening lap to hold sixth spot as Kamui overtook Kimi Raikkonen into turn one to move into 11th. Jarno dropped a position on the second lap but then put in a series of quick times in the run up to his first pit stop, when he continued with medium rubber. On the same lap, the hard-charging Kamui, on a heavy fuel load and one-stop strategy, passed new World Champion Jenson Button for ninth. By the time his only pit stop arrived, he was running third while Jarno was battling in the top six. Kamui resumed the fight, now on soft tyres, and kept up a strong pace to stay in contention for the top six. Jarno made a late pit stop for soft rubber and resumed just behind Kamui, with the two TF109s crossing the finishing line just a few seconds apart. That result gives Toyota 59.5 points and fifth place in the Constructors' Championship, while in the Drivers' Championship, Jarno is eighth (32.5pts), Timo Glock, who missed the final two races of the season due to injury, is 10th (24pts) and Kamui is 18th (3pts). Kamui Kobayashi: "It was a really good race for me. At the start I overtook (Kimi) Raikkonen and that was important in the end because it would have been difficult to finish in the top six if I had been behind him during the first stint. When I got past I was confident I had the race pace to fight for the points and my target was to be consistently fast. The team did a great job with the strategy and the pit stop which played a big part in helping me finish in the points. I certainly wasn't expecting to be racing in Formula 1 this season and I want to say thank you to Toyota for this opportunity. My target was to finish in the points today but I am a bit surprised to be in the top six. This is a fantastic result and I am extremely happy." Jarno Trulli: "It was not an easy race for me. I made a good start and was fighting with the BMWs on the first laps, which was good fun, but I was struggling a little with traction. During the stint the rear tyres were degrading and then later braking consistency became an issue. I was pushing as hard as possible and putting in some good laps to fight for the top six. In the end I was seventh, which is not bad, and for the team the result is pretty good. Obviously Kamui drove really well and I am very pleased for him; he deserved this result." Tadashi Yamashina, Team Principal: "It was a great result for us to have both drivers in the points in the last race of 2009. Kamui did a fantastic job and we are very proud of him but Jarno also fought hard to get a strong result. This year the team, including everyone back in the factory in Cologne, has done a brilliant job. It's been a tough season but we have ended it in a positive way, so thanks to everyone in the team, as well as our sponsors and fans. I would like to offer my congratulations to the race organisers, who have done a fantastic job to create this incredible venue and also to the new World Champions, Brawn GP and Jenson Button, who achieved so much this season."